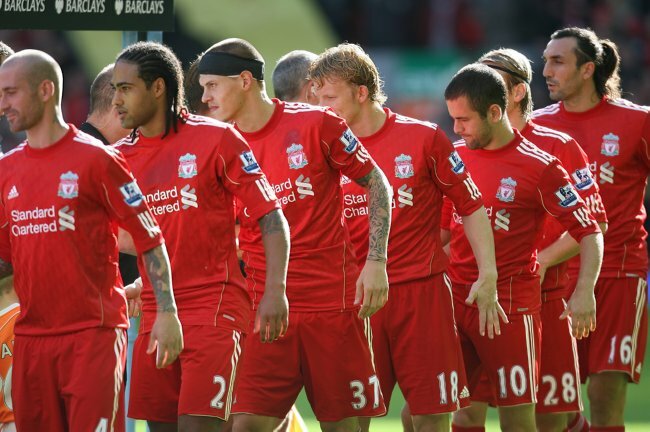 Liverpool Mull Five-Way Squad Flush-Out, Make Room For Over-Priced English Defender? After bringing in a bevvy of new faces over the summer, it seems that Kenny Dalglish is keen to move on a few of his fringe players/dead wood before September rolls around, with five players being mooted for export this morning. We’ll start with the most unlikely to go through, with the whisperings that Inter Milan are sniffing around Dirk Kuyt again, though it’s thought that Dutchman and his glorious mane of wet spaghetti hair will snub any offer from Italy as he’d much prefer to stay at Anfield until they chuck him out – a wise choice. Secondly, word is that AC Milan are all set to tie up a deal for Alberto Aquilani by the end of the week, before switching their sights and pursuing Peter Crouch of Spurs fame – yep, that Peter Crouch. Elsewhere, overly hirsute centre-back Sotoris Kyrgiakos has officially left Liverpool and signed for Wolfsburg on a two-year deal as of this morning, with Joe Cole the subject of a loan approach from QPR and David N’Gog teetering on the brink of joining Bolton for somewhere around £3.5-4 million. On the acquisitions side, Mick McCarthy has apparently told Liverpool where to stick their interest in hard-working striker Kevin Doyle, but several papers seem to agree that an £8 million deal for Birmingham defender Scott Dann is being explored. Phew, what do you make of all that malarkey then ‘Pool fans? Surely it’d be a bit of a wrench watching Joe Cole leave after so many months of dedicated service? the ‘kuyt to inter’ rumor is actually a story from last summer that has been reproduced by accident by some italian newspaper. The only one of them I’d like to see leave this summer is N’Gog. Sell him to Bolton in some kind of cash + player deal for Gary Cahill. Cole should stick around a bit longer, give him another season or at least half a season to show he is of some use. Sell Degan, Poulson & Ngog as a matter of urgency. Keep Kuyt as 3rd striker/Right winger! Ngog, Poulson, Ngog, Cole, Soto all set to go and Scott Dann, Sebastian Coates or Gary Cahill will come in, hopefully. So if we get another center back then we’ll have Carra,Agger,Skrtel and whoever we sign. Do we really need 4 center backs? 8 million for Dann is not over-priced. @Griffi, Agger will inevitably become injured, Carra is too slow and Skrtel now has some injury problems of his own. I think another center half is a necessity. 4 center backs? as a united supporter, i can tell you the answer is yes. you never know what will happen. Don’t be silly, Joe Cole is better than Messi, don’t you know? 4 decent centre-backs has to be a given for any top six club. Just signed Coates, he looks like he’s gotta lot of potential! !